New York : Speak, 2006. 274 pages, 17 pages ; 20 cm. Reading Counts: Level 4.9 / 14.0 Points / 30236. Point Blank / Anthony Horowitz. Originally published: [New York] : Philomel Books, 2002. Includes an excerpt from the next novel in the series: Skeleton key. Accelerated Reader AR-ATOS MG+ 4.8 8.0 59168. Reading Counts RC 4.9 14.0 30236. 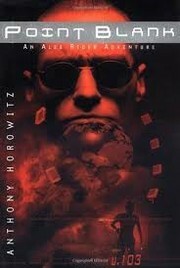 Sequel to: Horowitz, Anthony, 1955- Stormbreaker. Horowitz, Anthony, 1955- Alex Rider adventure. $c Statement of responsibility Anthony Horowitz. $c Date of prod/dist/manuf/copyrt 2006. 500 General Note $a General note Sequel to: Stormbreaker. 500 General Note $a General note Originally published: [New York] : Philomel Books, 2002. 500 General Note $a General note Includes an excerpt from the next novel in the series: Skeleton key. 520 Summary $a Summary, etc. note Fourteen-year-old Alex continues his work as a spy for the British MI6, investigating an exclusive school for boys in the French Alps. 521 Target Audience 0 $a Target audience note 4.8. 521 Target Audience 2 $a Target audience note 6-9. 655 IT:Genre 7 $a Genre/form data or focus term Spy stories. $t Title of a work Stormbreaker. $t Title of a work Alex Rider adventure.